Australia is known for its amazing wildlife and the famous Blue Mountains World Heritage area in New South Wales is home to over 400 different types of animals. Up in the gorges and valleys of the tablelands, threatened and rare animals can thrive in a natural habitat in a vast region of 1,032,649-hectares filled with vegetation and brimming with life. Entering the Blue Mountains, you immediately feel dwarfed by the miles and miles of eucalyptus forest that arethe Blue Mountains. The mountains give off a blue-ish hazy feel that comes from the oils eucalyptus leaves, which gives the mountains its name. The Blue Mountains stretch further than the eye can see and are extremely dense with overgrowth and trees. If decide to take a bushwalk, make sure someone knows where you are and where you are going. There are a number of bushwalks you can take to get up close with some of these rare animals, or you can visit the Jenolan Caves to try and catch a wallaby’s eye and marvel at the complex limestone caves. Check out some of the unusual wildlife you could find in the Blue Mountains below. The Tiger Quoll is the largest surviving carnivore on mainland Australia and grow fifty percent bigger than other quolls. You can spot it by its white spots, pointed snout and sharp teeth. Tiger quolls are nocturnal and solitary and can cover long distances of over six kilometres overnight. They usually hunt at night and eat medium-sized mammals like possums, rabbits and even small wallabies as well as birds and eggs. They are classed as a vulnerable species in New South Wales. The yellow-bellied glider is a grey-brown marsupial with an off-white to orange or yellow belly. Around the size of a rabbit, it has big pointed ears and a long tail and is the largest species of Petaurus, a group of arboreal marsupials. It can glide for up to 150 metres and has been observed to jump over 100 metres. 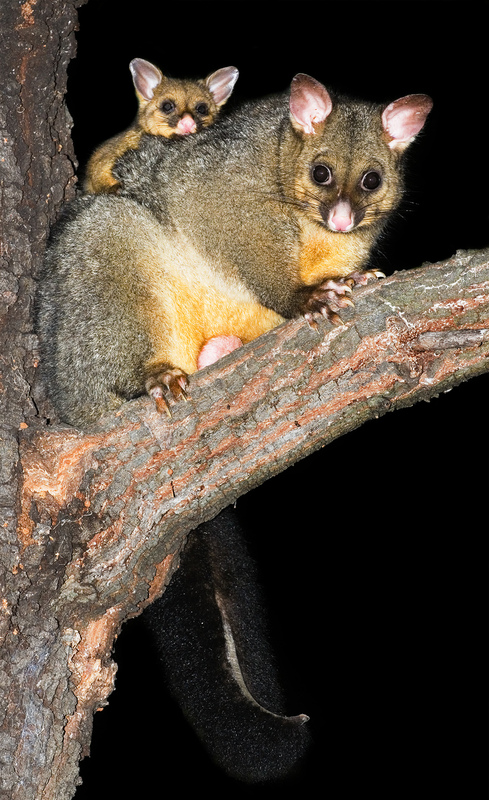 The marsupial’s diet is made up of small insects, nectar, honeydew and pollen as well as a range of tree saps including eucalyptus sap which it collects by biting a V shape into the bark and suckling on the flow of gum and sap. Currently classes as a vulnerable species in New South Wales, the Long-Nosed Potoroo is a small greyish-brown marsupial. Its long nose makes it similar to a bandicoot but its robust hind legs give away its link to the kangaroo family. It lives below the trees and mainly eats fungi as well as underground fruit, roots, tubers and insects and their larvae. Mainly nocturnal, the long-nosed potoroo spends the day hiding in dense vegetation and is a non-territorial solitary animal. Once the most popular frog on Australia’s southeastern coast, the green and golden bell frog can be recognised by its bright pea-green back with blotchy metallic brown or golden markings. Their population has declined due to loss of habitat and introduced predators and is now classed as endangered in New South Wales. It likes to live in large, open-water swamps or ponds that have dense vegetation and although endangered, the frog can still be found in a number of areas. The Blue Mountain Water Skink is a black medium-sized lizard with narrow yellow-bronze or white stripes along its back, which turns into spots on its tail. It is native to New South Wales and restricted to the swamps of the middle and upper Blue Mountains area, appearing at high elevations between 560 metres and 1060 metres. This semi-aquatic reptile is active on warm, sunny days and eats grasshoppers, moths, weevils, wasps and flies. If you see one don’t disturb it, it will flee to shelter in dense shrubs or holes in the ground.